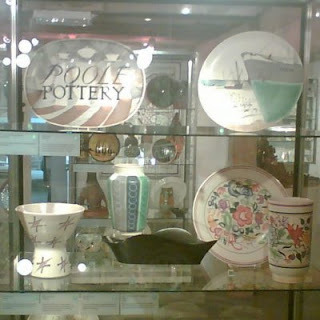 A blog dedicated to collectors of Poole Pottery and other antiques and collectables. The BBC Antiques Road Trip programme has been back on the screens of late in series 2. I have to admit to quite liking this show, even though it seems to depend on the experts beating dealers down to way below cost price. Why do the dealers always end up saying "oh alright then"? It just proves there are three prices in this world - retail price, wholesale price and TV price! Anyhow, apart from that quibble, it is a fairly watchable show with picturesque views, amiable banter and classic cars. It is good to see how many antiques shops still survive round the country and the interesting stock that can be found. This series came close to home when it visited the Townsford Mill Antiques Centre in Halstead (or Hall-stead as Tim Wonnacott calls it) in episode 24, filmed in May 2010. David Barby and Philip Serrell both bought some silver and Philip stood in front of my own cabinet at one point (blocking the view!) but didn't look at the Poole. Just as well, I probably couldn't afford a visit from them. Then in epsiode 28 Anita Manning visited the Poole Pottery Studio on the quay in Poole. She threw a slightly wobbly pot with Alan White. The top fell off at one point, to which Alan drolly observed that it would now be a smaller pot than anticipated! Good to see the Studio getting some TV exposure. I recently heard from Chris White, who was a thrower at Poole between 1975 and 1980, and whose distinctive CW monogram can often be found on the hand-thrown Delphis, Aegean, Traditional and other pots of this period. In fact, Chris thinks he must have thrown tens of thousands of pots! Chris has been living and working in Finland for 30 years as a ceramist, having 10 Finnish Master Championships, 2 Scandinavian Master Championships and exhibitions in Japan, Sweden, Holland, England and France. More recently, he has become a wilderness guide as well! You can read more about his current venture at his website http://www.northtrek.net/. Chris tells me that he has just got his pottery workshop into working order. In the workshop I was surprised to learn he still has the turning lathe that Jimmy Soper used to turn all the hand-thrown ware in the Craft section at Poole Pottery. This was to give a smooth surface to the pots for the paintresses to work on. I hadn't realised Jimmy Soper was still working at Poole in the 1970's. He is, of course, best remembered for the banded vases of the late 1930's and early 1950's which echoed the style of Keith Murray at Wedgwood. Chris says "You could say Jimmy was part of the old Poole Pottery, he worshiped the place, and had his hands full teaching us young ones! One day he put 3 or 4 trucks of ware outside to dry (for turning), he didnt noticed that they had frozen, when he bought them in they all started to collapse!`Well I´m Buggered´ was his comment." Chris bought the lathe from Poole Pottery together with the original blocks used for shapes 15, 31, 84, 93 and 660. Chris promised Jimmy he would take care of the lathe - which he has, as it is still in excellent working order! This picture is of some of Chris's more recent ceramic work. If any old workmates would like to get in touch Chris would be pleased to hear from you via his website. 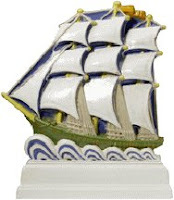 Offering a great deal of benefits for the collector and Poole Pottery enthusiast, members will receive a club badge modelled on the new club emblem “The Galleon”, club magazines and membership card which entitles the holder to a 10% discount off limited edition pieces at the Poole shop on the Quay. A brand new feature for the very first time is a member’s only website containing a huge online reference library of information just waiting to be discovered, and member’s only forum to chat with other members. We have various membership options to include single, joint & international, we have also included a special rate for Poole Dorset residents, along with a special rate for current and former Poole Pottery artists/designers. To join the Poole Pottery Collectors Club online please visit www.poolepotterycollectorsclub.co.uk or you may call in at the Poole shop on the quay for an application form, we would be very pleased to see you. Alternatively you may call Steve on 01285 659674 (daytime) or Ed on 0114 2530054 (evenings) to request an application form. Since March 2008 Ed and Steve have worked tirelessly to launch the new and official Poole Pottery Collectors Club and are delighted to announce that in conjunction with Peter Bello, Chief Executive, Poole Pottery 2007 Limited, the club is now open with members already joining and the club is growing day by day, Ed and Steve are looking forward to welcoming new members during the coming months. I am delighted to welcome you to the new Poole Pottery Collectors Club to which Poole Pottery is giving its full support. 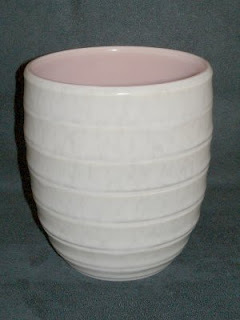 Lifestyle Group purchased the assets of Poole Pottery from administration in 2007. Since then, we have been actively re-building the infrastructure and the Poole brand. We established a Studio Pottery in the Poole Store on the Quay. Design, Limited Editions and production of certain lines sold in the store are manufactured by the Studio Pottery. The team on the quay consists of Alan White, the Master Potter and artists - Jane Brewer, Nicola Massarella, and sprayer, Graham Moss. The latest creation from the team is African Sky which was recently launched and proving to be a best-seller. The Poole production facilities were recreated at the Royal Stafford site in Stoke on Trent under the guidance of Norman Tempest, Managing Director of Poole 2007 and Royal Stafford. Alan and his team relocated to Stoke for 15 weeks to assist in training the artists and production team. This was a mammoth task – involving the removal of kilns, production machinery and people. Glazes had to be re-formulated and in some cases – from scratch, the first Poole Pottery production in Stoke commenced in September 2007. Capacity has increased ever since and we are delighted with the results achieved by the Stoke Team led by the factory’s manager, John Nixon. Our initial focus was to restore the production of the best selling lines such as Volcano and Gemstones. In the Spring of 2008, we launched African Sky and Himalayan Poppy. We have just released initial quantities of the Imagination Design – which is a new departure in Duck Egg Blue, Cream and Metallic hues. The design is contemporary and in keeping with current colour trends. We are keen to work closely with the Collectors Club. We recognise that member’s feedback can be a tremendous asset. We are keen to preserve the heritage of the brand we have inherited. We are acutely aware of the troubled waters that Poole has navigated through over recent years. Our focus is to develop the brand and manufacture the Collectables of tomorrow. I do hope to hear from and meet members in the near future. Poole Museum has recently re-opened after refurbishment. 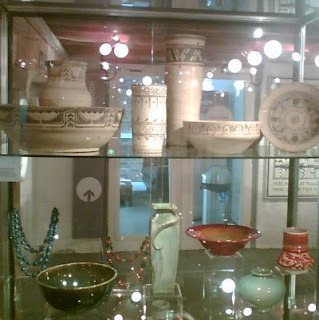 On display is an extensive collection of Poole Pottery, mainly sourced from the Poole Pottery Museum archive auction at Christies in March 2004. 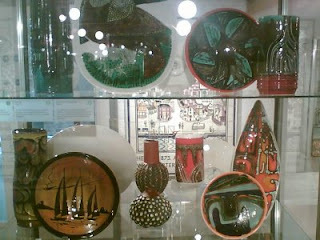 Many of these pieces are pictured in the Hayward and Atterbury Poole Pottery book. The earliest items are examples of Owen Carter’s lustre ware dating from just after the turn of the century, displayed together with James Radley Young lustre, unqlazed and early tin glazed pieces from c. 1915. A particularly striking piece is the green lustre-glazed vase with a moulded Lizard decoration applied by Lily Graham. There are some interesting and rarely seen Harold and Phoebe Stabler and Joseph Roelants figures dating from 1915-1920, including the iconic Buster Boy figure and an elaborate bull figure group. This apparently retailed at £6 6s at top department stores Heals and Liberty’s when issued. There is a selection of bookends from the mid to late 1920’s, including elephant and mounted knight models by Harold Brownsword and a Harold Stabler small galleon. Moving onto more familiar territory there are quite a few 1930’s Truda Carter designed traditional pieces, including two good art deco patterns (GPA and YE), and also a number of Arthur Bradbury designed ship plates. One of these depicts an Empire Flying Boat from 1940 in Poole Harbour; only 6 of these were made. The 1950’s is represented by a small number of items from the Alfred Read period, including a 12” Freya plate and Poole Pottery plaque designed by his daughter Ann Read. There is also a collection of coronation pieces. Delphis and Studio fans may be a little disappointed as there is nothing particularly spectacular from this period, although there is a small collection of 1960’s pieces and some 1970’s Aegean and Atlantis. Unusual is a carved vase by Tony Morris and Guy Sydenham, which is a copy of a vase presented to HRH Princess Margaret in 1966, and an early Robert Jefferson owl dish. One curiosity is the red stoneware miniature bottle kiln made by Guy Sydenham in 1973 to commemorate the centenary of Poole Pottery. This is pictured in H&A on p168 but is quite fun to look at for real as the interior of the kiln contains miniature examples of pots in all the different Poole Pottery styles from Owen Carter lustre ware to 1970’s Delphis. Away from the display cabinets is an extensive collection of Carter Tiles, including the famous Edward Bawden designed tile panel depicting a map of Poole and the words “Here in 1873 at Poole Pottery were Carter tiles first made”. 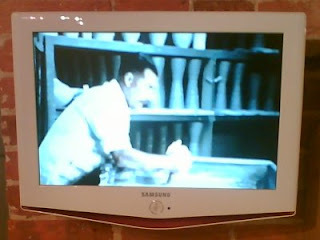 There are also various architectural sculptures, faience plaques and a video film of the factory in c. 1970. This includes some footage of Guy Sydenham throwing. The entire third floor is dedicated to Pottery and ceramics of various kinds and other interesting exhibits include 16th & 17th century Bellarmines, known to have influenced Guy Sydenham, and a collection of Broadstone Joyous pottery (often mis-sold as Poole). At the time of writing the museum is open from Monday to Saturday 10 a.m. – 5 p.m. and on Sundays from 12 p.m. until 5 p.m. Admission is free. However, please check details with the museum before visiting. Apologies, but I have been neglecting this blog recently due to other commitments. So what's been happening in the last few months? Poole Pottery is still at the quay shop, but still looking for new premises I understand. No change there then. 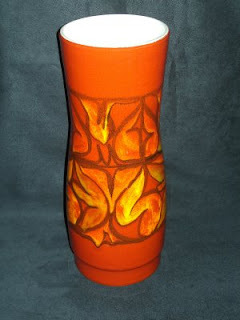 Giftware is being produced and painted in Staffordshire and I have heard that retailers are now receiving supplies. I was on holiday in Devon this summer and it was quite a shock on visiting the Dartington Glass factory to see the Poole section in the shop stocked only with Lifestyle branded products of a most un-Poole like nature. The studio section within the quay shop is now operational after some initial delays and the limited edition Sunface plates are reaching their owners. There has been quite a turnover of store managers in the last few months, Michael Collins being the latest and, I am assured, best so far! A new initiative seems to be the selling of one-offs and special editions through Poole Pottery Online, an eBay shop. For the last few months the Poole Pottery website has just displayed a holding page saying "Under New Management". However, at the time of writing the website seems to have disappeared altogether so I am not sure what is happening in that department. An interesting development is that Roger Hartley of Poole Zone has acquired some retail space upstairs within the quay shop, together with a small workshop, and is selling the current work of ex-Poole paintresses such as Carol Cutler, Janet Laird, Sue Pottinger and Lynn Gregory under the Poole Zone brand. This is said to be in collaboration with Poole Pottery, rather than in competition. One obvious possibility is that this will form the basis of an enlarged Poole Studio operation, featuring familiar names from the past as an attraction to collectors. Something to keep an eye on. I hope to be able to visit in the next few weeks. Over the summer I had the pleasure of meeting with, and interviewing, Nikki Massarella, for an article that will appear in the forthcoming issue of the "All About Poole Pottery" collectors journal (which will probably be published in Spring 2008). Nikki is a delightful lady with a wonderful career at Poole Pottery spanning 28 years. I would love to tell you more but I had better wait until the magazine is published! Talking of publications, I see that this months edition of Antiques Info magazine has an article on Poole Pottery written by Roland Head, together with three pages of illustrated auction results. The article is a well informed piece with some accurate observations on the secondary Poole marketplace, with the one quibble that the Alfred Read period is completely overlooked! I would argue that without the diversification of the product range and adoption of contemporary design philosophy that Read began in the 1950's there would have been no Delphis. He should not be underestimated! And, of course, there is a distinct market for 1950's pieces. I believe Roland is the man behind the excellent Perfect Pieces blog (rather more frequently updated than my own!) He has been kind enough to link to this blog in the past so now I have an opportunity to return the favour. Finally, we are just a couple of weeks away from the autumn Poole Pottery auction at Cottees. The catalogue has just been released and, as always, there is much to interest the Poole collector. More on this in due course. Welcome to the Poole Room blog. The Poole Room sells antique and collectable Poole Pottery online at www.pooleroom.co.uk and, together with other items, at antique fairs and at Townsford Mill Antiques Centre, The Causeway, Halstead, Essex, CO9 1ET. Sun Shines at Cottees Shock!